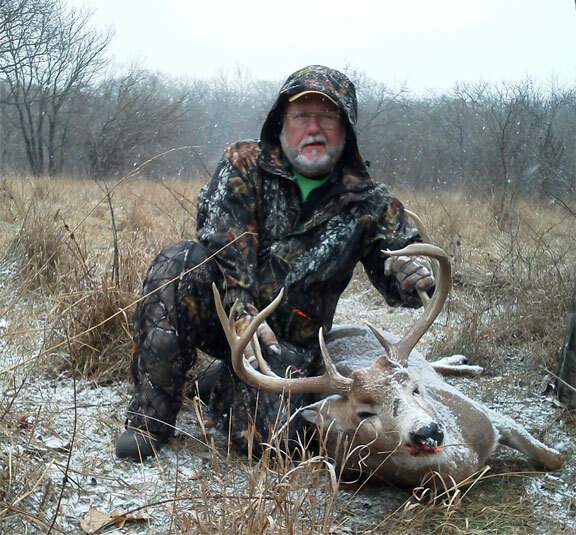 Applicants sometimes ask about Association’s efforts at developing deer habitat. Most notably food plots. Their size, number, composition. Believing hunting is always better over a food plot than on natural or existing habitat. This Association does not develop any habitat enhancement such as food plots. Those who have planted food plots fully understand why this is so. All of our hunting is on wild game covering natural habitat. In this case our habitat has plentiful during season feed sources. So much so it becomes a limited concern. Our best leases are within 45% to 55% grain cropland use region. There is plenty of food. This is not big woods hunting where a half acre food plot is the only preferred food source concentrating deer. 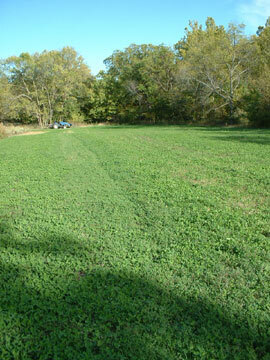 Pictured is a clover alfalfa mixed food plot. At one acre in size, an enhancement – or so we thought. It took two seasons to develop a rich carpet of succulent growth making 3 to 5 cuttings a summer to maintain it from flowering, sustaining 5 to 10 inch height to ensure its attracting capability. It was re-seeded using 50 pounds of seed in spring, again in fall to maintain its coverage filling in gaps. Seed average cost was $1.20/pound for one year. Or, a $120 for the growing season. Plus cost of time, equipment, maintenance machine hours. An experiment on one of this Association’s partner’s personal farms. Turned out great for spring turkey season. It did nothing for deer. Especially during prime season. 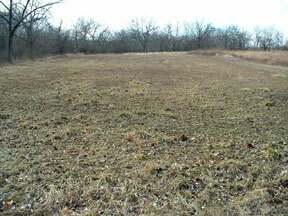 The same food plot as pictured above later that winter. During firearms season. When we would like to see its greatest productivity. What we have is a field of nothing as its clover/alfalfa mix all went dormant. It did not withstand seasonal weather change. 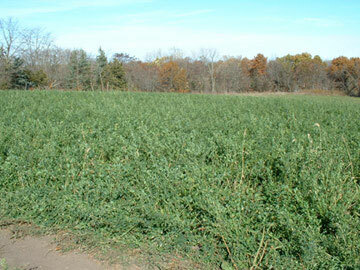 Costs of developing then sustaining even a one acre food plot should be evident. If we were to develop a 100 such acres that would be an additional $12,000. Not counting transportation, equipment costs, hourly wages. All making it far more cost effective to lease whitetail attracting feed/cover than attempt to create it using food plots. What we offer is first hand experience. Productive local trophy region habitat that naturally exists. Not an organization that seeks to impress using magazine article picture rich fill pages appearances. Food plots like ATV advertisements seem additive to many hunters greater than its benefit. Farmers do much to supply year round feed. Field edge browse, succulent young growing cops, waste grain, winter green wheat. At right. 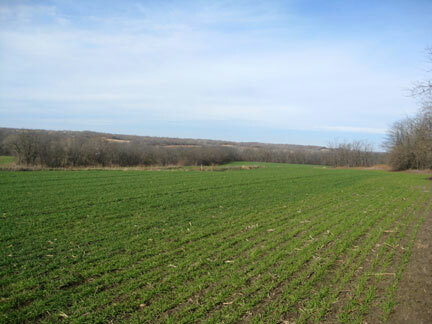 This is an alfalfa field of over 50 acres surrounded by a wooded creek bottom with water. Pictured during our early archery season. Three necessary elements of feed, water, cover, in one tight area providing needs for more than just a few deer. Big woods hunters find our central mid-west abundance of food a new experience. A reversal of habitat they frequently find in their home state in northern, eastern and south east United States. Cover/food in those regions consists of large wood forests with limited food sources. Their building food plots pays off. A reverse exists in Kansas, Missouri or Iowa. Food is everywhere, cover changes to native grass, brush, limited acreage wood patches. Or, demonstrates to us a precedence order for trophy whitetail. Food is first food then cover. All rendering a food plot just one small spot amongst a greater acreage of various feed types. 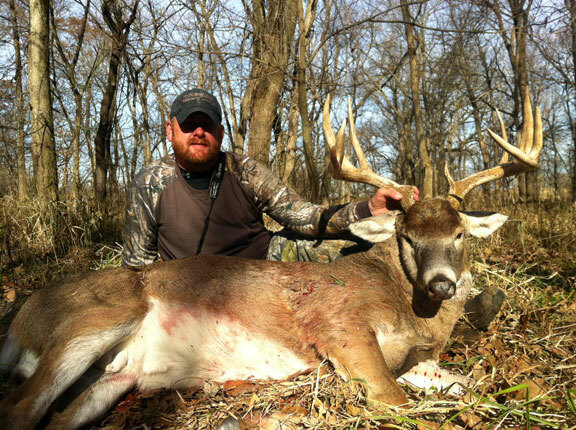 Jamie, farm land not food plot buck. A winter wheat field that can be found repeated many times over. Winter wheat remains green through to spring and beyond. A succulent deer food available during all portion of deer season. This field is 210 acres. 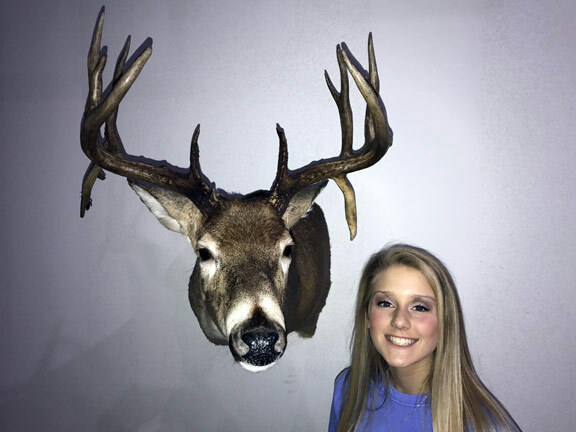 It runs along a number of wooded drainage, small wood patches within a rather large watershed well known for its trophy whitetail. Unlike in a big woods state where a 1/2 acre food plot concentrates deer patterns, in our central Midwest our large grain crop farmland diffuses deer patterns. A seemingly obvious distinction many must experience firsthand before believing it.